Met Éireann has issued a Status Orange rainfall warning for counties Cork and Waterford, warning of hazardous driving conditions until this evening. The warning is one of several across the country with a Yellow rainfall warning, which runs until 6pm, also in place for Kilkenny, Wexford, Kerry, Limerick and Tipperary. Two Status Yellow wind warnings have also been issued, one covering counties Donegal, Galway, Mayo, Cork and Kerry, until 7pm with gusts of up to 110kmh. The other wind alert is for Dublin, Carlow, Kildare, Kilkenny, Laois, Wexford, Offaly, Leitrim, Roscommon, Sligo, Clare, Limerick, Tipperary and Waterford, with gusts expected to reach up to 100kmh. The alert remains in place until 5pm. The national forecast today is for cool, wet and windy conditions, with temperatures from 7-10C in strong to gale force and gusty southeasterly winds. The rain will be heaviest and most persistent in southern counties, where there is a risk of spot flooding. 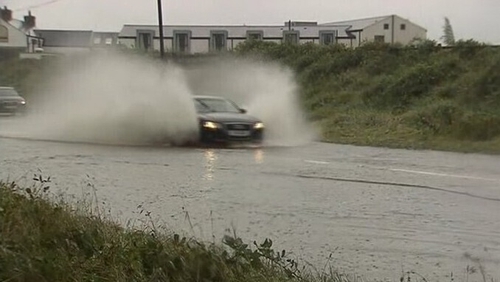 Cork and Kerry have been experiencing very heavy rainfall this morning with localised road flooding. The rain will tend to be more scattered and intermittent elsewhere, but some heavier bursts will still occur. Clearances will develop in the south and west this evening and tonight with clear spells developing and just the odd shower. Temperatures tonight will drop from 2-5C with gusty southeasterly winds abating. Outbreaks of rain will, however, persist in the north and east. A few patches of mist will also occur. Tomorrow and the rest of the week will see an improvement with dry and sunny conditions bringing highs of 16 and 20C by Friday.